Scanspeak 32W/4878T00 Sub-Woofer - Revelator Range. The 32W/4878T00 is the most powerful sub woofer designed by Scan-speak. Very high 350W nominal, 1000W Peak output. Scanspeak 32W/4878T00 Sub-Woofer - Revelator Range. 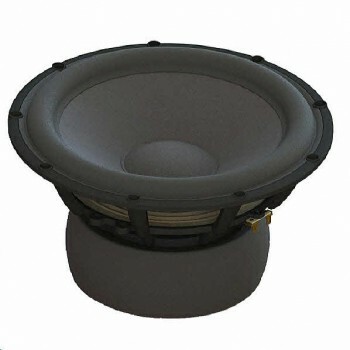 The 32W/4878T00 is the most powerful sub woofer designed by Scan-speak. Featuring a large 3” voice coil on a titanium former, extreme ± 14mm linear excursion and low resonance frequency is it perfect to reproduce the deepest frequencies. It features a brand new type of paper-sandwich cone with a special foam filling technology (patented) that gives the cone very high stiffness and relative low weight. The motor system has heavy duty copper sleeves for optimizing eddy currents and minimizing self-induction. 4 Ohm 13" unit. High Sensitivity 90dB. Paper Sandwich rigid cone. Die-Cast Aluminum Chassis vented below balanced spider. Long Throw Rubber surround, Gold binding post terminals, Patented Symmetrical Drive motor and a very high 350W nominal & 1000W Peak output.